I am sharing a fascinating collection of 5 Vintage Anatomical Heart Pictures! These are FREE for you to use as your ‘heart‘ desires. I have scanned these from old Science Books and antique Anatomy Books that I have bought over the years. I come from a medical family and I truly find those Antique Medical books very interesting. My Dad was a Pathologist and my Mom, Sister, and Brother-in-Law are nurses. In this assortment you can take a look at the anatomy of the human heart. These Anatomical Heart Medical Illustrations are highly detailed drawings that blend art with science. We begin with a magnificent color Heart Illustration. Then we move into four monotype prints, which are possibly woodcuts, engravings, or lithographs. They might be fun to use in your Valentine’s Day Craft or Mixed Media Projects! 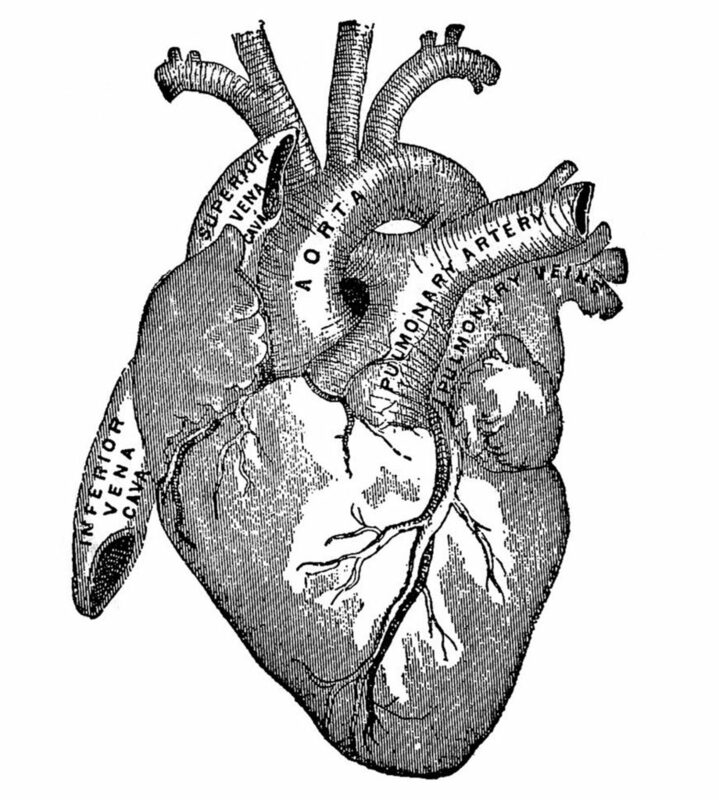 You might also want to create a heart themed Junk Journal from these beautiful Anatomical Heart Images. Above is a pair of wonderful monotype Anatomical Heart Images from a Vintage Circa 1884 Science Book! I am offering two versions–a black and white as well as a red version. In this detailed Anatomical Heart Graphic, I think it is fascinating how the parts intertwine and circle each other. I love the two wing shaped sections at the top left and middle right (see the C and D areas of the illustration). To me they seem to be embracing the heart. Isn’t that captivating? I think this is an engraving or a lithograph. I have seen these Anatomical Heart Medical Illustrations used in everything from Shrinky Dink Jewelry to Pillows! For project ideas with this image, please check out the Cute Cameo Necklaces that this TGF Reader made HERE. Next in our collection of Vintage Anatomical Heart Pictures, I have this black and white Anatomical Heart, which appears to me like a pencil drawn wood cut. It comes from an 1890’s Antique Anatomy book. All of the major sections of the heart are labeled. The veins and vessels look like trees and branches to me. Isn’t it intriguing how patterns are repeated throughout nature? I’ve made a red version as well, in case you want to use it on a Valentine’s Day card or project! 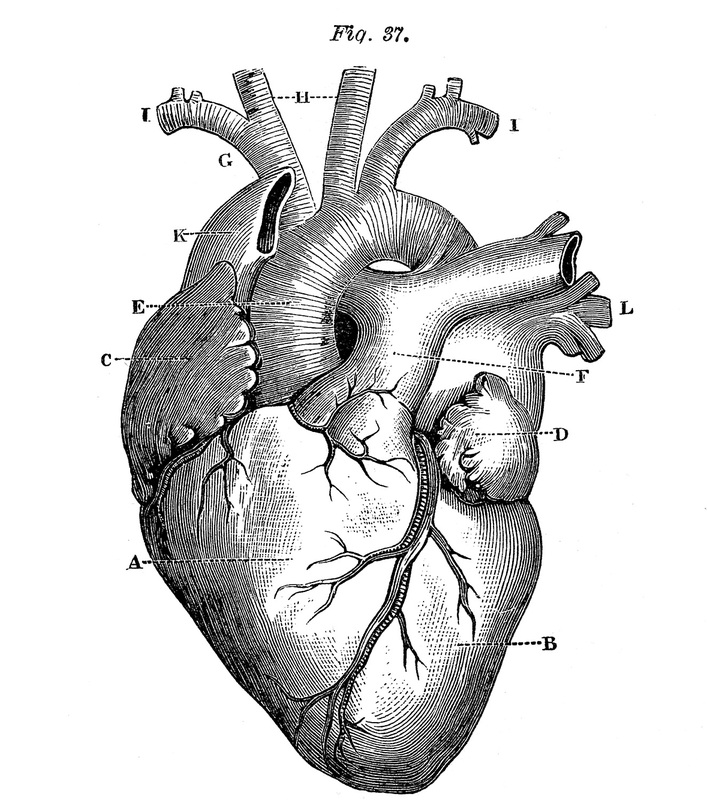 Above is a medical diagram of an Anatomical Heart Drawing from an old Nurses Anatomy book. 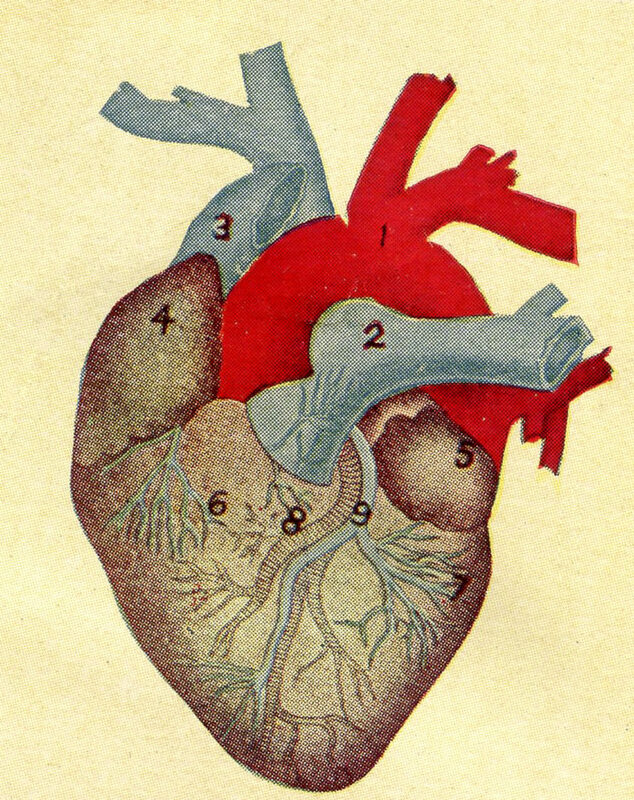 It is a full color Heart Illustration with blue and red sections along with black and white. It is an anatomically correct heart drawing illustrating valves, veins, vessels, ventricles, chambers, etc. All of these are noted with text descriptions. There is a full range of tonal values in this traditional pencil technique Medical Illustration. It is a unique artwork indeed and very interesting to view. It’s unfortunately not a huge image, this is one that I scanned many years ago, before I understand resolution and such. I have been trying to find this page so that I can rescan it, but as of yet I have not been able to locate it. I did manage to find this one from the same book. It is a high resolution scan and hopefully one that you can find a use for. 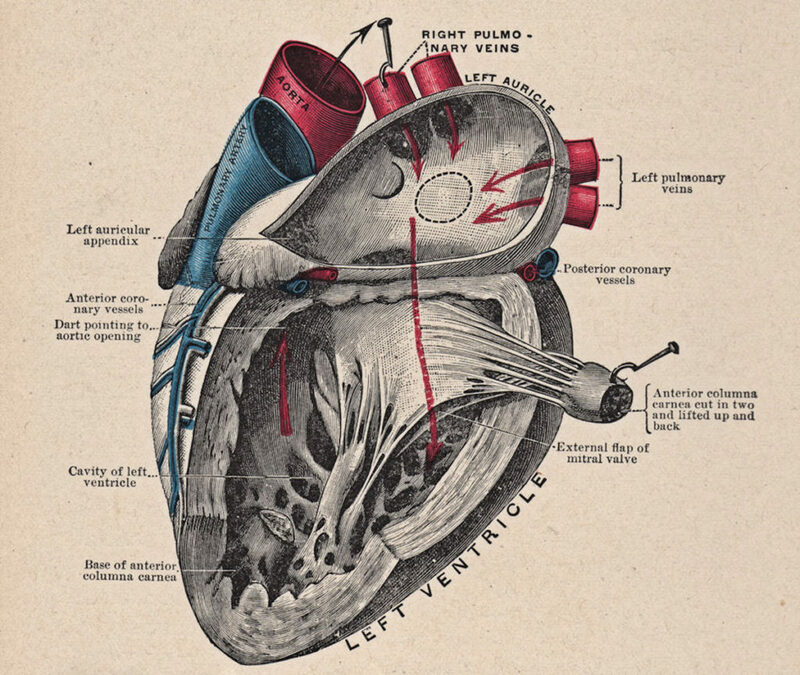 I hope you enjoyed this curated collection of 5 Vintage Anatomical Heart Pictures. You might also like our 40 Free Valentine Images HERE! « DIY Retro Valentine Exploding Candy Box! This is a great anatomical version! This is BEAUTIFUL! Thank you Karen! Would love to see the original old version with the list of names to go with the letters – an old yellowed page of this would be very cool too! Hi Dave, Sorry I get a lot of requests for this stuff, and there just aren’t enough hours in the day! Try using Picmonkey it’s free and fun to use. There is a feature called “Textures” if you select that, and then select “Use your own”, you can upload your own background. Maybe that would work for you? Another option would be to go to Fiverr and hire someone for $5, to do it for you. Hope that helps! Do you know the name of the text book this came from? Hi Ken, No, I’m afraid not. It was falling apart and moldy so I just pulled out the best pages and through the rest away. Sorry! Thankyou so much for the beautiful scarlet anatomical heart image – we have incorporated it into our band’s (Sunday Heart Parade) album cover, which will be on iTunes etc. from Fri 3rd November. Much appreciated! If you are interested, i could send you a Jpeg of the cover artwork. This is very nice!! 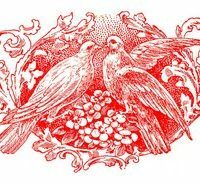 I’d like to use this for my tattoo? Is that gonna be fine?? I’d like your permission if ever. Hi Charles, Yes, that’s fine! Hi! I wanted to design a shirt of red bubble for a band that I like and was wondering if I could use this image on the design? If not that’s totally okay!! Hi! Your work is beautiful, congrats!! Is it ok if I use the image for a logo at school project?